It's 1914 in New Jersey and the Kopp sisters live on a farm and fend for themselves. On a day trip into town their buggy is hit by an oncoming car. The driver, Henry Kaufman is a rich factory owner but he is certainly no gentleman and neither are his friends who accompany him. When Constance Kopp confronts Mr. Kaufman about paying for the damages to the sisters' buggy, he refuses to pay. Henry and his friends proceed to harass the Kopp sisters via threatening visits to their farm and Black Hand-style letters. Everyone expects Constance to back down from Henry and his threats, but her stubborn righteousness just won't let her give up. She enlists the sheriff and his deputies to help but when this doesn't work, she pursues it all the way to court involving the media too. 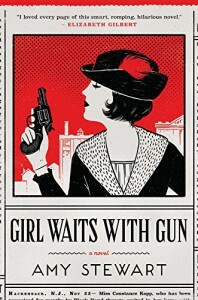 This author has built a well-defined character who is based on the real Constance Kopp and newspaper accounts of the time. Constance went on to become one of the nation's first female deputy sheriffs. I enjoyed this book and I think that Amy Stewart has done an interesting and entertaining job turning her research into a novel.